Briard Dogs - The Briard is a large breed of dog, one of many herding breeds and originates from France. The Briard was originally bred to herd as well as guard flocks of sheep. This makes the Briard different from those breeds that only guard and those that only herd. The Briard is a rugged, agile dog, having harsh coat and double dewclaws mounted low on each rear leg, resembling additional toes. Bred for centuries to herd, the additional digits on each rear foot give the Briard the ability of pivoting on one foot for quick turns and complete turn arounds, which are necessary when herding and guarding their flocks. The Briard is a very loyal and protective breed. Once bonded to their family members, they will be very protective. This information is licensed under the GNU Free Documentation License. It uses material from the Briard article on Wikipedia.org. 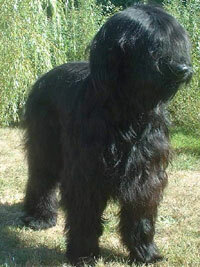 Briard Breeders - Advertise your kennel puppies and dogs here.